The residents of Crich (pronounced cry-ch) in Derbyshire are very lucky – They have the loaf – a wonderful artisan bakery – deli – cafe run by Andrew Auld and his partner Roger. We made a slight detour on our recent trip to the Dales in order to go and visit him. We have exchanged recipes and posts on Dan Lepard’s forum and I had a great time being shown round the bakery and getting a serious lesson in making 100 per cent spelt breads and pasteis de natas. I think I’m getting the hang of the bread finally and I have no excuse now not to make those custard tarts as I have been given all the info to make them work! 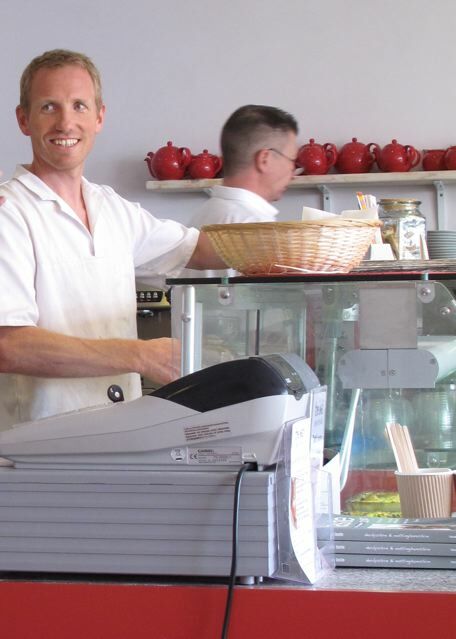 Andy makes a full range of breads from 100% rye sourdough to traditional wholemeal loaves, there’s a cafe serving great food, and a deli section as well. His list of breads is flexible and there is always something new coming up. He has customers who come from miles away to stock up on his wonderful breads. This business is an inspiration showing that you can go into baking from a non-conventional background providing you have the enthusiasm and the passion to do it and are prepared to work seven days a week to make a go of it with 3 am starts! The french baguettes at the loaf are made from Jeffrey Hamelman’s poolish formula, though I read on Andy’s website that he is making some new italian style baguettes as well now, he also offers one of Mick Hartley’s seed and sourdough specials every Saturday. 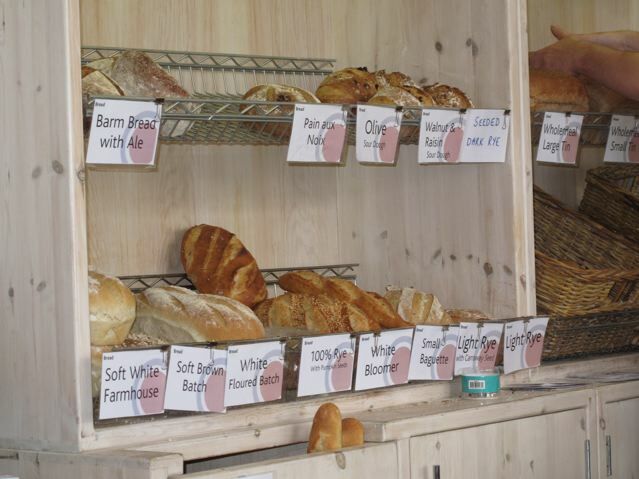 These are all tried and tested breads that sell well and are popular with their customers. This is sounding like one of those reviews you read in a paper, it’s not meant to be. We had a lovely time; the sun shone, we got to look at a bakery, admire the five deck oven and talk about proving baskets and the price of flour and how to get your scones to rise straight and not twisted. It was great fun. Go and visit the loaf if you are over that way, that’s what I want to say – and keep talking – exchange thoughts and ideas – and everyone will get to eat better bread, whether you bake it yourself or live near an oasis of a bakery like this one. And if you are lucky enough to have a good bakery near you, then don’t forget to support them and buy the bread that someone has been up at all hours of the night getting ready so it is fresh for you in the morning. I’d love to hear about your favourite breads and your favourite bakeries, though I might get very jealous! This entry was posted in Bakers, Bread, Holidays and tagged Andrew Auld, crich, the loaf on 05/09/2010 by Joanna. I have been after a Portugese custard pie recipe for ages…no excuses now ! I downloaded the pdf from that link that you posted…is your recipe different to the link ? would be great to make in parallel but mine are going to have to wait until weekend after next….this is a bit like the film Julie and Julia isn’t it….have you seen it ? reminded me of “operation panettone” last Christmas…..
Those breads look superb! I think I would have one of each thanks…and Portugese custard tarts always go down very well. Favourite bakery Bourke Street Bakery. Sourdough heaven and luckily enough I have the cookbook and can try and replicate everything in their shop. Brydie, I read how great Australian sourdough is all the time and am very envious. I don’t know if I would have baked so much if I could get real quality bread at a price that fitted my pocket close to home. Most of the people who read this blog are probably people who bake their own bread most of the time, so I don’t intend to ‘review’ loads of bakeries, but this one is special to me, part of my small web of baking acquaintances. ah no thats the problem. A quality bread at a reasonable price. There are some great sourdoughs happening here in Sydney, but you have to be prepared to pay for it. Luckily through the encouragement of delightful blogs (such as yourself) I can say piddlewiddlediddle and make my own. Brasserie Bread is another good one here too, they have the monopoly of the sourdough classes. hello, Paul Rhodes bakery just opened upon my brand new walk to school with your nephew. Will pop in and report on it for you – went to the original branch in Greenwich a while ago, and it was pretty good…..here’s a groovy blog post with film about it…. I said I’d be jealous … Lucky you! Thanks for the link Tutak. I watched the clip about the Greenwich bread as well, sounds delicious. It was so lovely to have you pop in, Joanna. Sitting for a few hours chatting to a fellow baking enthusiast was a delight – and I learnt so much too. Got to make those pasteis this weekend – you are too kind Andrew! Have a read about this bakery in London that Tutak posted a link to. They are making a bread with the ‘spent grain’ from a brewery http://chandoselletson.com/category/paul-rhodes-bakery/ – Sounds interesting doesn’t it? the loaf’s barm bread is excellent though! I love to hear from you with your stories and thoughts on the posts I write and will reply as soon as I can. © All text and photos are copyright 2008 – 2017 Zeb Bakes, Joanna Baron or Brian Kent. All rights reserved. Please ask before using. Don't want to miss a post? Leave your email here..